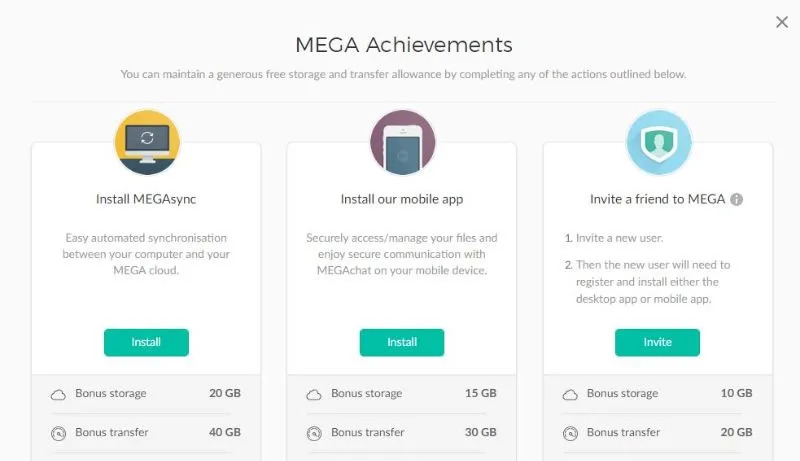 MEGA Review – Get a Mega Free Storage up to 50GB? Overall : 4/5 – Recommended! Nowadays, cloud storage has become the default option for many people to store and back-up their data. There are countless cloud storage services providers out there. Most of them offer different plans and functions. Some are better to be used for individual purpose while others are good for business organizations. Hence, it can be hard to pick the right cloud service provider for your needs. Most of them come with great features and fantastic prices. If you want to learn more about cloud storage providers, you should check our review on 30 free cloud storage providers. In this MEGA review, we will take a look at this particular cloud storage provider with all-you-need-to-know details about their security, file sharing, upload, pricing, and other features as well as pros and cons. Background of MEGA – The Privacy Company? Launched by Kim Dotcom in 2013, this cloud storage service provider prides on its strong commitment to user privacy and security. However, MEGA was built upon the shoulders of another service, Megaupload, which was launched by the same founder in 2005. Unfortunately, Megaupload closed in 2012. In some way, MEGA draws added history and expertise when it comes to cloud storage systems. Yet, Dropbox has over 500 million registered users whereas MEGA claims over 130 million registered users. In its own way, the numbers speak for itself despite the vast amount of cloud storage services out there. What makes MEGA interesting though is that it incorporates one of the best zero-knowledge encryption. Their encryption architecture allows you to have control over your cloud encryption keys; in other words, no prying eyes on your own data. Their architecture extends to protect your shares to ensure that only people is you, who are authorized to read them. That said, let’s take a look at their features, pricing and customer support in more details below. MEGA key features are somewhat different compared to other cloud storage providers. The likes of Google Drive and Dropbox focus more on utility attributions, whereas MEGA is centered more on security features. While the rest are skew towards certain attribution, we found that pCloud is the right balance for Utility + Security. Read our full review on pCloud here. If you would like to know more about other cloud services that focus on security, you should check out our article on 3 Most Secure Cloud Storage Services on Planet Earth. MEGA features are well designed and user-friendly. Signing up to MEGA was a piece of cake. All you have to do is key in your email address and a strong password. If MEGA thinks that your password is not strong enough, it will automatically notify you to change it. Additionally, MEGA sends a random-generated master key in a text file that you need to save on the assumptions that if you do lose your password, you can use the master key to gain access into your account. That’s a nice gesture and brilliant simple step. Forget the Password Manager and just write or copy it down like the old-schooler. Here are the 3 incredible features that make it stand out from the other cloud storage services. MEGA allows you to access data at anytime, anywhere but prevents from others accessing it. However, if you do want to share access, MEGA provides you with the option to add your contacts to share files with them. You can either give them access to view or edit the files. You can either give them the permission to Read-only, Read and Write or granted Full Access. For users who are not registered in the MEGA system, you can add them to share your files. All you have to do is enter their email address, and they are automatically inserted into your contacts. MEGA also provides real-time collaboration as well. Very similar to Google Drive, it allows two people to update the same file at the same time. Link without a key: MEGA will generate a URL link and a decryption key that can be shared separately. Link with a key: MEGA will generate a URL link with the decryption key embedded in it. Of course, the first option offers better control for you, but at the end of the day, it’s really up to you. However, if you choose to go with MEGA Pro, the benefits of that control become an advantage for you as users can protect their link shares with password protection and expiry dates. MEGA utilizes superior encryption to secure your files and chat in real time. The data is also encrypted and decrypted during the transfer process, unlike the other cloud storage services, by the associated client devices. The collaboration feature in MEGA is entirely private and secured. It facilitates real-time sharing between users and viewing updates on contacts, making it convenient for you. Moreover, MEGA offers extra functions such as their mobile apps allow access to folders and files from your smart phones and tablets. You can also upload and sync files anywhere to the cloud. One thing for sure about MEGA is that they ensure easy automation for synchronizing purpose. Not only that, MEGA provides email, chat, calling and video conference features in their system. All communicated are encrypted giving you the privacy that you always wanted. MEGA also utilizes Versioning feature in their system. It is by default in their MEGAsync settings that you will have multiple versions of the same file. So, if someone makes a mistake or deletes the file, you can replace the current one with a previous version. If you sync or upload another file with the same name as another existing file in the same place, a new version of it will be created. There will be a clock icon indicating files have multiple versions. MEGA allows you to preview your photos and play videos. It’s a good option for media purpose, but it’s not quite good enough to be used for pictures and videos storage. Moreover, MEGA doesn’t have any technology partnerships to streamline your file collaboration and doesn’t offer integration with Microsoft Office, unlike Dropbox who partnered with Microsoft Office to edit files. Dropbox are now able to integrate with Google Docs, Sheets and Slides. For now, it’s only available to Dropbox Business. As you probably know by now, many cloud services offer multiple, flexible plans that allow you to select the one that best matches your needs. MEGA follows the same philosophy as they provide 1 free plan and 4 premium plans. *Do note that the price in your local currency is for estimation only. The actual charges are in the Euros for all transaction. Of course, the premium plans offer better value than the free plan. However, one of the best things about MEGA is that they provide an impressive 50GB of free cloud storage in their free plan. 15GB free storage is the actual permanent storage that user will be enjoying as a free user, while the additional 35GB will expired after one month of signup. More of a marketing gimmick in our opinion. However, if you need more than 15GB of space, then it is recommended to select the PRO I plan as MEGA advertise this plan as the most popular. PRO I Plan offers 1TB storage and 2TB transfer. Also, if you do purchase a one-year PRO plan, you get 2 months for free. A transfer quota is the amount of data you can transfer between your selected account service and your devices per month. In PRO I plan, you get 2TB of transfer quota that refreshed every month. The price is € 9.99 for PRO I Plan which doesn’t give a competitive advantage with other popular choices such as pCloud or Sync.com. Sync.com offers $5 per month for 1TB storage, but they require you to pay in advance for the year. On the other hand, pCloud Lifetime is provide the best bargain of all. They offer 2TB storage, paid once $350 and you’re good to go. For more information about these two storage services, read our reviews: Despite the price, MEGA is still one of the top best free storage providers. MEGA processes file transfers at the most available speed regardless of your chosen plan. However, if your transfer speed is affected by other factors such as your local network or your Internet Service Provider, it goes beyond MEGA’s control. Nevertheless, the speed and rate in uploading files into MEGA is good. So far, there are no significant complaints or bad reviews on speed itself. Adopting a cloud storage service can be risky especially if you have sensitive files that might be a potential target with ransom ware or hack. Either way, it’s always good to do your research first on cloud storage security before choosing. You should definitely check out our article on 7 Key Factors to Consider Before Moving to Cloud Storage. Most cloud storage providers adopt excellent security protocols and encryption to protect your files at rest and in transit such TLS protocol, two-factor authentication and end-to-end encryption. But here what makes MEGA interesting is that they emphasize on privacy. They use private encryption to encrypt files on your side. Moreover, they utilize AES 128-bit at the level of at-rest encryption, which comes as a surprise because AES 256-bit is stronger than the latter option. Nevertheless, it is still good in terms of security perceptive as it provides excellent encryption protection. More on MEGA security features here. The TLS protocol in MEGA adds an extra layer of protection to files that are in transit. They also offer two-factor authentication. Besides its robust security features, MEGA is also known for its engaging desktop app for users. It provides a system tray icon and sync folder, which manages your sync concept and gives access to the settings. It also presents clear information that won’t confuse you and best of all, this app works on Windows, MacOS, and Linux. Most cloud storage services do not function in Linux operating systems. Not to mention, the web interface is fast and easy to use. You can go through the folders using the menu displayed on the left or the “recent” page, which you can access again using the left displayed menu. You can also access the menu to view other lists shown in the menu, such as your contacts, shared content, chat communication and dashboard. The secondary featured are located in the top right corner of the screen menu. Using this menu, you can perform general actions whereas individual actions need you to right-click a file. Just like any other cloud storage service, MEGA has its own mobile app. It is currently available for iOS and Android. As you can see, the file browser takes most of the screen space while the rest of the functions are placed below as a menu to access your chat, view your camera upload, view folders, and your other files. You can also set up the app to automatically upload your videos and photo. But as mentioned above, it’s not the ideal cloud storage service for videos and images storage. Though you guys want to know more details on how the MEGA achievements work and what are the validity of it. I’ve created a path how you can actually gain all the bonuses, just remember all the bonuses had expiry date. MEGA’s goal in sync feature is to create a seamless experience across all user’s connected devices, and they did a pretty good job. Once you downloaded the desktop app, it automatically creates a MEGA sync folder on your device. After syncing, all you have to do is to choose any folder to upload to MEGA. It will copy the file to your sync folder and your account space. You can also do the same by copying the file manually into your sync folder or use their “upload” option from the system tray. One of the most exciting features about MEGA is that they offer the ability to stream files that are synced to your computer. More file type capability are on it’s way. Moreover, MEGA’s website allows you to share your files by generating a link which was previously mentioned at “Secured Global Access” content. Generating a link makes this unique feature known as zero-knowledge encryption. The only people who have access to the key can read them. You can also attach the key with your link. In another option, you can attach passwords or add expiry dates to the links as well. 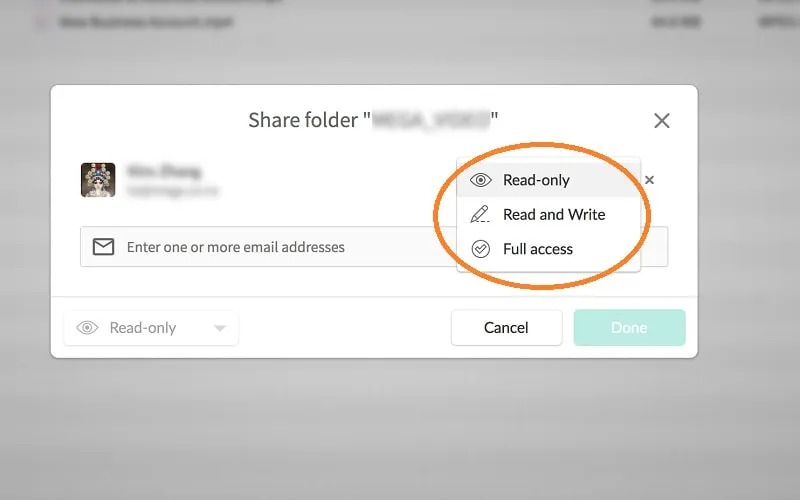 Similar to file sharing, you can share a folder by generating a link. If you do that, you can set 3 different permissions – “read-only”, “read and write” or “full access”. If you want to invite others to upload files into your folder, including non-MEGA users, you have the option to turn it into a “MEGAdrop” folder. The desktop app allows you to share too, by generating a link. However, you can’t invite others through folder generated-link or generated upload-link. Conclusion – is MEGA safe to use? Firstly of all, Mega.nz features end-to-end encryption. Not all cloud storage providers utilize end-to-end encryption in their features, so this is definitely a step up for MEGA against its competitors. It also comes as a massive plus-point advantage for anyone who doesn’t want anyone to pry on their data. In context, MEGA could access the encrypted files, but could not decrypt them. In short, there’s no point for them to get to your files as well. As you probably know by now, MEGA uses AES-128 encryption. This encryption adds faster response times and decreases the lag. It also provides an excellent user experience through increased high speeds. Next, their two-factor authentication feature is what lacks in most cloud storage providers. Some of the most massive clouds storage providers do not include two-factor authentication in their systems. This is what makes MEGA better than the others. Furthermore, MEGA complied with the EU General Data Protection Regulations in May 2018. It was implemented to protect your privacy while using their service. MEGA’s extra steps in ensuring to protect user privacy and overall security showed a great promise in cloud storage purpose. While their end-to-end security measure is an excellent incentive to choose MEGA, their free 50GB is undoubtedly another great reason to use their service. Not to mention, their password protection and link expiration for sharing files is a huge plus. Though, they don’t have any advanced sharing features, such as Google Drive sharing features. All you have to do is create a public link to share on MEGA. All things considered, MEGA is an all-rounded cloud storage provider. 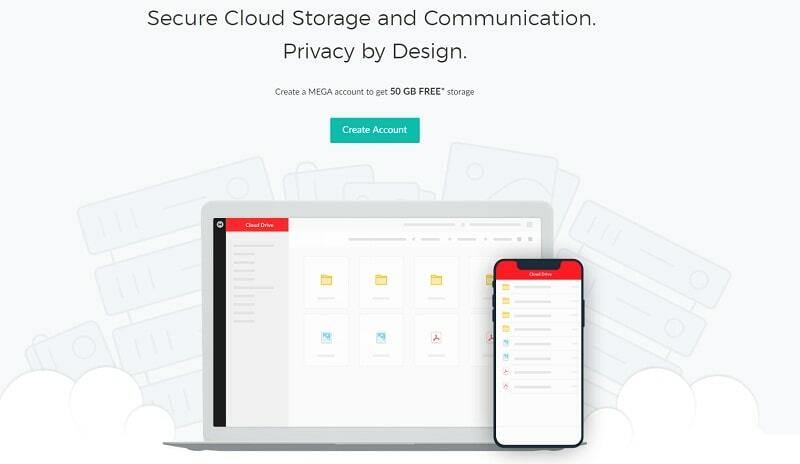 MEGA may be different from other cloud storages; their secured 50GB of free cloud storage is an attractive offer that you cannot refuse with some give-and-take.